Please join me for the exciting new release of The Risen King, the new book by Samantha Warren, coming out on December 30! The Risen King is the third and final book in the series of the same name. The first book, The Iron Locket, is available for free on all e-retailers. In an unprecedented move, three corners of Faery have joined together to defend their land from the terrible Leanansidhe. King Arthur has risen once again to the height of power and stands strong with Queen Aiofe at his side. In this final book of the Risen King trilogy, they go head-to-head with the most powerful faery the land has ever faced. Where can you find The Risen King? Samantha Warren is a sci-fi, horror, and fantasy author who spends her days immersed in spaceships, dragons, and vampires. She milks cows for fun and collects zombie gnomes. 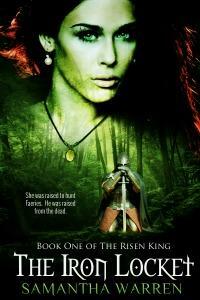 Thank you for participating in the Risen King blog tour. Happy reading!